Description: A brilliant incarnation of a stylized lantern used to illuminate old world fortress paths and alleyways in historic Paris. The graceful scrolled arm, curved header and step design are featured in a Golden Bronze finish for a rich look. The Clear Seeded Glass lens opens from the front for easy lamp replacement (bulbs are supplied by the customer). 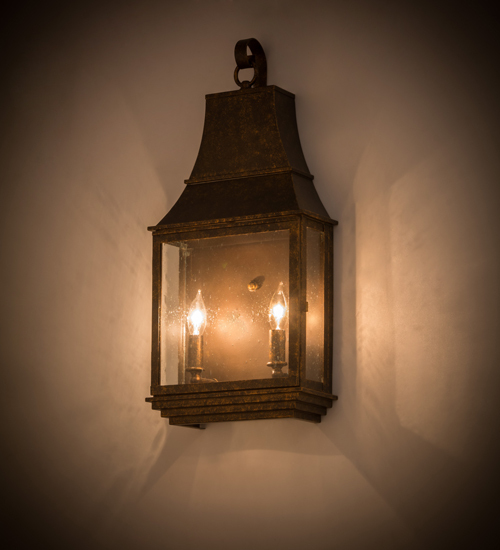 Hand crafted by highly skilled artisans in our Yorkville, NY manufacturing facility, this fixture is available in custom sizes, designs and styles as well as dimmable energy efficient lamping. The fixture is UL and cUL listed for damp and dry locations.